Town chairman David Bosomworth says he is “hopeful” that the club will add to their squad before the end of the January transfer window. 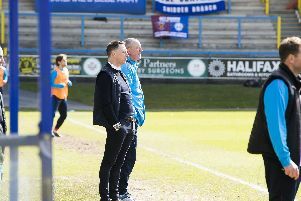 Town have added Jack Muldoon, Ross Killock and Will Hatfield to their squad already during the window, and the Shay chief is hoping the recruitment drive won’t end there, although he remained tight-lipped about who could be set to join The Shaymen. He said: “We’re hoping to conclude some business before the end of play today.